I can't believe it's February already! Whoa, where did time go?! I have been very busy teaching, which is great!! But that leaves me with little time to do what I love to do, stitching and reading/commenting on blogs! That's okay though, I need to catch up on yucky bills and things. I really wanted to make another post for January but it wasn't in the cards for me. I have a number of things to show you so I will jump right to it. First of all, I forgot to post a picture of my finished reindeer ornament, designed by Daffycat. I made it for my Dad for Christmas and he loved it. Here he is with his special holiday moose hat he always wears! He loves his moose!!! Onto the next piece. Last weekend, I quickly stitched up this sweet little design for my friend's birthday (the one who made the tags!) I used Daffycat's ribbon tutorial to finish it and it turned out beautifully!! 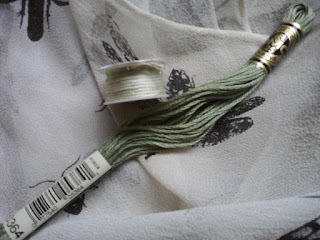 The ribbon I used is from HDF and when I ordered it, awhile ago, I didn't realize how tiny it would be. It's 2mm!!! I seriously have a problem with picturing measurements in my mind's eye. Anyways, it took me about an hour to get it going. It was so fiddly!! 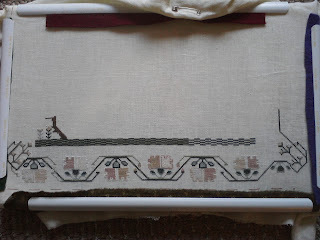 After I got the ribbon edging on its way, it took me another hour and half to go around the design! OI I say! I'm glad to report that my friend has received it and has it already displayed! I made her a card too but forgot take a photo of it. Maybe she will take a picture of it and send it to me so I can show you all how pretty it is. 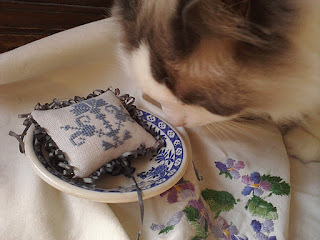 While taking photos of the little scissor fob/ornie, Titus came rolling in to help. Oh that sweet little Titus! He's so sweet and curious! Really curious about my stitching. Yesterday he jumped up on my sewing desk and was smelling Jane! OI that boy!! I had to get him off. This then became a game!! So now I have to hide Jane from my curious kitty. Speaking of Jane, I finally got the DMC thread and actually got the flosses that came before and after the recommended number, just in case! I wasn't about to do another trip to Michael's for a thread! Funnily enough, when I got home and compared the greens, the shades are so completely different I had to take a picture to show all of you. Crazy hey?!! Needless to say, my TUSAL jar has become fuller with the light green that I frogged. I put in the new green and I am happy with the change!!! Eh. The sun went down as I was taking these photos. The colours are so much nicer in person. Well, it's time for me to go. I hope you have enjoyed the pictures of Titus. He really is the funniest cat around. He acts like a dog and is scared of the strangest things. I will tell you more about that another time. It will probably be a Titus only post!! I'll leave you with hugs and meows from me and Titus!! Awww, Titus is a cutie! One time I left my stitching sitting on my laptop -- which I often do. When I got back to the room, there was Mia sitting on my stitching!! And it was a model too! She never did that before either! Thank goodness she hasn't done it since. Your stitching is wonderful! 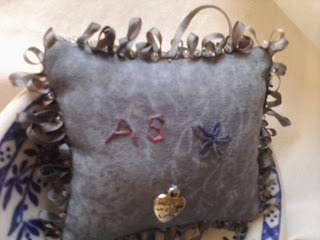 Love how that pillow came out! Obviously, so does Titus. lol! Jane is gorgeous -- I like that green a whole lot better. And the pic of your dad with his ornie -- so cute! 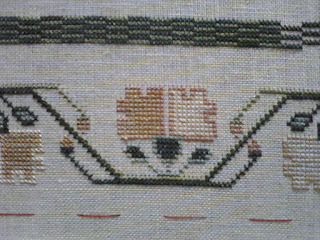 Lovely stitching. Your finishes are both great too. Loved the story about your husband's comment. Titus looks gorgeous. Titus is gorgeous, your reindeer hat made me chuckle. very sweet finishes..both of them are so sweet..
your reindeer hat is so cute too.. 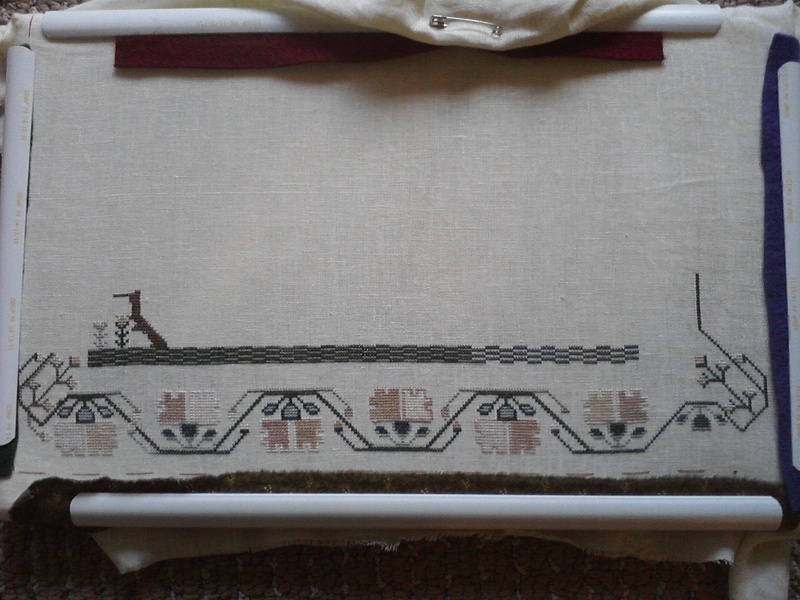 Your sampler progress is looking great. Titus has such lovely blue eyes! I love colors of your stitch. Love your finishes. Great job with the ribbon. I have some of that and I was surprised at how narrow it was too. Haven't tried using it, but you have definitely inspired me. Titus looks so cuddly! But do you have to deal with those long cat hairs everywhere? The hat is awesome! So is you reindeer ornament! The ribbon edging looks great...I'm still trying to pluck up the courage to try it! Love the pictures of the cat, he's gorgeous! Your finishes are just lovely. Love dad wearing his ornament. Love the pictures of Titus, it is so fun to have a little helper. Glad to hear you are working some. Ravioli?! Too funny! I think it's lovely and I like your other ornie to. I can't believe the difference in those greens. I much prefer the DMC. Good move to change it out. I'm sure you'll be much happier with it in the end. Jane is looking great and that Titus is a total cutie! 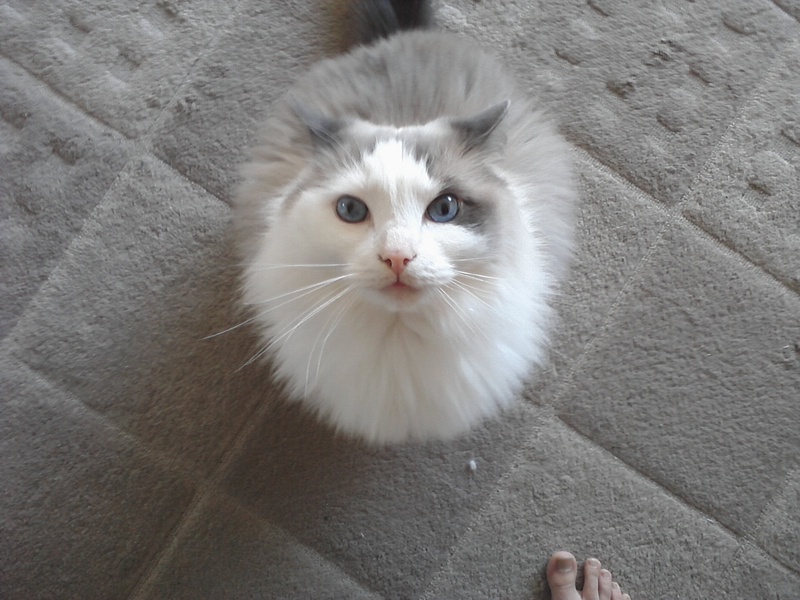 I want to cuddle your kitty! Lovely stitching and great finishes with awesome models to display them, lol! Love Titus! Well done on the ornaments! Boy, that was a difference in color! I'm glad to hear you're much happier now. And what a great job on those ornaments. 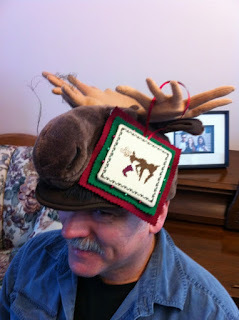 The moose hat on your dad is a riot--my oldest son has a thing for moose, too... Love the ribbon edging--I haven't tried that yet, but the look is well worth how long it took you to sew it on! Great stitching, and your Titus is super cute! 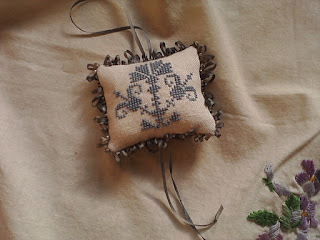 Great stitching! Looking forward to watching your progress! Titus is a beautiful kitty!! Gotta say, Titus makes me wish I wasn't allergic to cats. What a beauty he is, Annie!!! ROFLMAO, I can't see the ravioli!!! I looked and looked. Cute pillow for your friend, sweet. The fiddly ribbon was well worth it! I love your ribbon finish on your pillow! All of your fiddling with it has paid off. It looks really great. I can see how it would attract Titus' interest though! He is such a sweetie Anne! He reminds me very much of Clarisse. 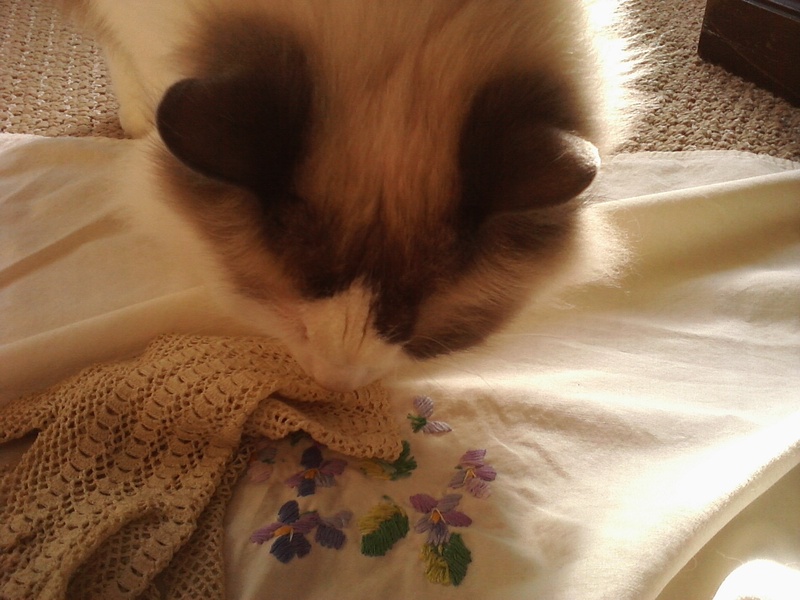 She also thinks she's a dog and she loves to get into my floss while I'm stitching. Awww Titus is so cute! Love your reindeer ornament and your the piece you stitched for your friend. That ribbon is so delicate! 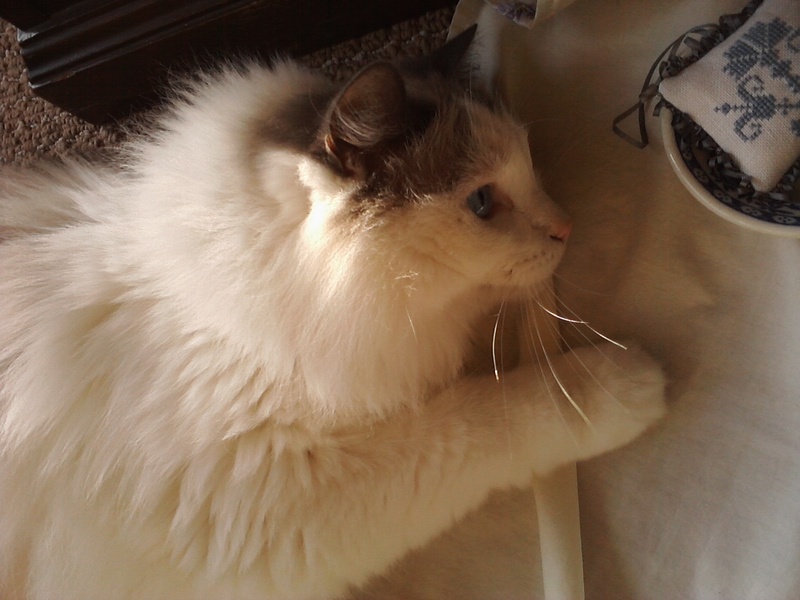 Titus is such a beautiful cat! Lovely stitching! ROFLOL at the ravioli comment. Your finishing is so nice. Jane is coming along nicely, too! Was the green on the spool DMC? Or some other brand? Your finishes are adorable! 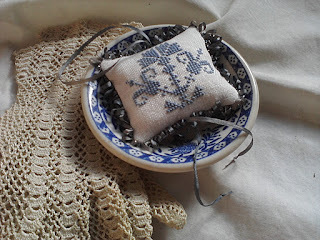 Thanks for the link to the tutorials on Daffy's blog... I had forgotten about them.